If you're a Chicago local, have ever visited our city, or simply follow the spirits industry, there's little chance that you haven't heard of The Violet Hour. Hidden behind a wall that regularly rotates between contributions from various artists, The Violet Hour is an intimate speakeasy lounge that focuses largely on pre-prohibition era cocktails. Their rotating cocktail menu is simultaneously creative and highly formulaic, and all of the drinks I've had the pleasure of trying are both complex and perfectly balanced. Lucky for us, The Violet Hour has now made a taste of their signature flavors available for home bartender use. 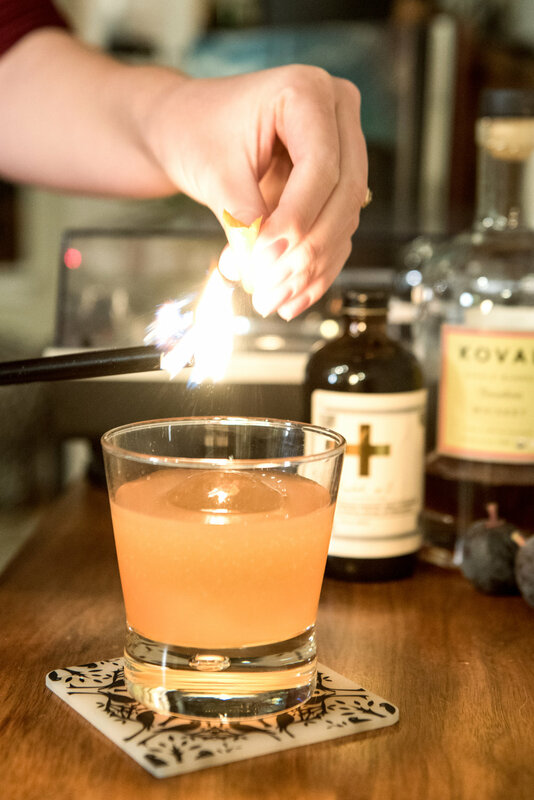 Managing Partner Eden Laurin crafted the first cocktail syrup, Batch No.1, with a natural blend of scorched demerara sugar, vanilla, orange, and bittering agents like wormwood, caccia bark, and licorice root. Her idea was to create a one-stop, approachable product that would efficiently offer sweetness and depth. My husband and I enjoyed the syrup in a Pimm's Cup and Sazerac while visiting the bar, but it's really so delicious that I could add it to just about anything or simply have a spoonful for dessert. One of the things that I found particularly meaningful is that Eden has used this product release as a means to help others. A portion of the proceeds goes to her nonprofit project, The Drinking Fountain, which aims to give back to communities who struggle with clean water access. The syrup was so packed with flavor that I didn't need to do much to make it shine. 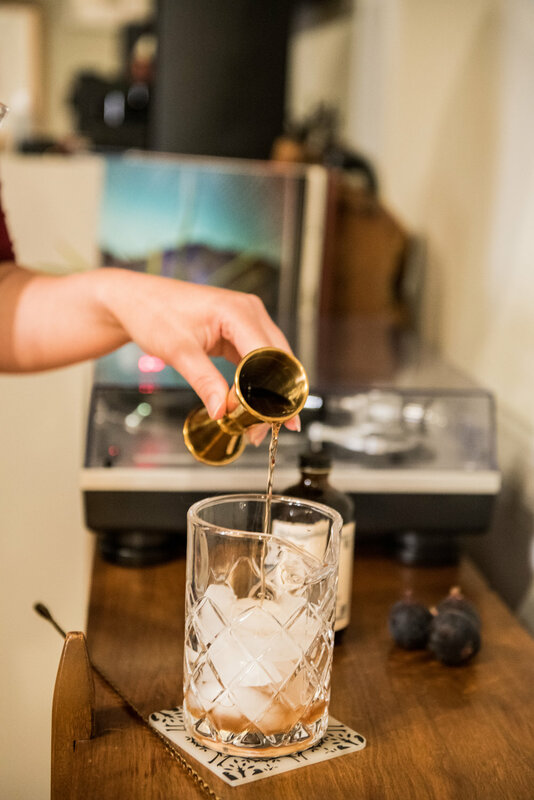 Eden's recommended recipe is to adapt the syrup into an Old Fashioned with 2 oz of your favorite spirit and a citrus peel. I ran with that inspiration but added several complimentary components. I finished off the drink with flamed orange peel for a deeper, roasted citrus oil scent and flavor. For garnish, I added fresh figs but you could use the citrus twist if you're making this drink after fig season is over. The resulting drink was strong yet delightfully smooth with an uplifting scent, rounded sweetness, and lingering complexity. Stir all ingredients other than orange peel and fig with ice until chilled, then strain into a rocks glass over a large ice cube. Run a flame along the orange peel and then express the orange oils onto the surface of the cocktail. Cut the fig in half lengthwise and slide both halves onto a cocktail spear. Enjoy while getting cozy under blankets and jamming out to your latest vinyl finds. 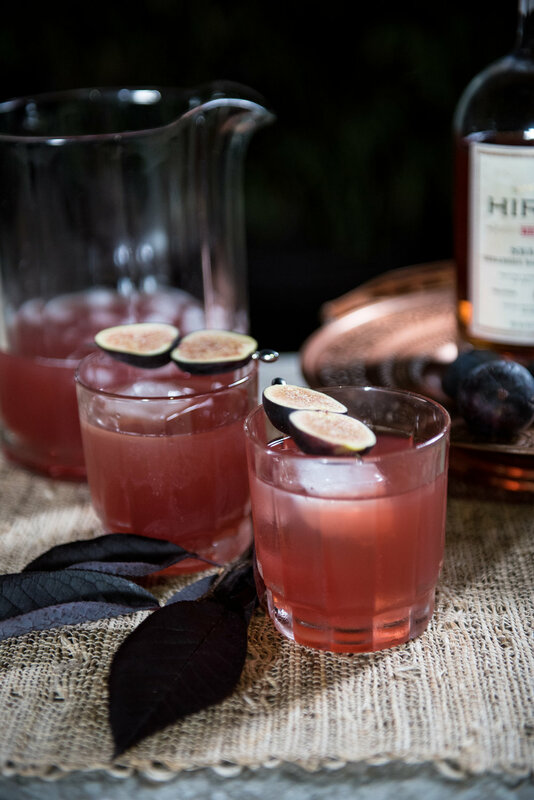 *To make fig-infused bourbon, place 4 sliced black figs into a 16 oz jar and fill with bourbon to the top. Put in a dark place and allow to infuse for 4-5 days, shaking and tasting occasionally. Strain with a fine mesh strainer when you're happy with the flavor. Thanks to Belen Aquino for the stunning cocktail photography and to Gather Vintage Tablescapes for the glass. More than likely, you've noticed the growing trend to eat seasonal produce. Summer brings a delicious array of berries. Fall offers apples, squash, and all sorts of unidentifiable root vegetables. What about winter and early spring? Though the Midwest is not incredibly plant friendly at this time of year, there is a wealth of amazing produce flourishing farther south. Let me make your winter a little brighter by introducing you to the glorious world of winter citrus (and teaching you how to harness it for cocktail purposes). I took this opportunity to learn more about the many varieties of one citrus family: oranges. Over the next couple of posts, I will share recipes crafted with navel, blood, and cara cara oranges. Each of the three are surprisingly unique in both flavor and appearance and create beautiful, simple garnishes for finishing your cocktails. Navel oranges are particularly great to mix with as they're wonderfully cheap this time of the year. I know my favorite grocery store may be somewhat of an anomaly, but I just picked up a 3lb bag for 99 cents! When thinking about how to highlight the vibrant sweetness of navel oranges, my mind drifted to one of my favorite dessert flavor pairings: chocolate and orange. If chocolate bars infused with orange flavor or chocolate covered candied orange slices could work so well, why not fresh squeezed orange juice and chocolate? Luckily, I had picked up a bitters sampler pack on a recent trip to Portland and so had access to some PDX cacao bitters to test my theory. Bitters are an excellent way to add a flavor component to your drink without watering it down or overdoing the sweetness. I chose to use a bit more than usual (5 drops vs my usual 3) because I really wanted the bold taste and aroma of chocolate. The only question left to answer was perhaps the most important one of all - what liquor would do this flavor combination justice? I instantly thought of whiskey but had some uncertainty as to which variety would be best. Luckily, I went for a visit to Chicago Distilling Company and quickly got my answer. I had been there for a tour a few years back and enjoyed all of their spirits and cocktail room (if you're local and haven't been, and also if you like learning about science, you really should do the tour). This time around, I got to taste their newest creations: beer-inspired specialty whiskeys and absinthe. The Stouted Single Malt Whiskey truly blew away in terms of both scent and taste. Let's be honest, I really can't say no to anything with a chocolate/coffee/nut flavor profile. Noah, the very knowledgeable and approachable head of Chicago Distilling's bar program, recommended I mix the Stouted Whiskey with another spirit due to its flavor strength. I tested a couple of options and settled on a 50/50 split with Trader Joe's Kentucky Bourbon (which is such a great value for making cocktails). Using the Stouted Whiskey in combination with another spirit is also a great way to make a small bottle go farther! I felt that adding some sweetness would make the chocolate flavors of the whiskey and bitters pop, so I rounded the drink off with a bit of dark maple syrup. The resulting cocktail is fresh, unbelievably smooth and decadent without being overly sweet or rich - a treat for whiskey lovers and sceptics alike! Shake all ingredients other than cacao powder with ice until chilled. Wet rim of a stemmed glass and dip in cacao powder to coat (simple syrup works even better to adhere the powder to the glass, if you have it on hand). Pour chilled mixture into glass and enjoy while listening to some throwback tunes and building up your positive vibes. Thanks to Belen Aquino for the stunning cocktail photography and to Gather Vintage Tablescapes for the tray and lovely glassware. I love tea, deeply and truly. That love has been ingrained in me since childhood by my family as tea is a staple in Ukrainian culture. Hosting and tea are practically synonymous (with plenty of snacks and sweets covering the table, of course). Growing up, I explored grassy Japanese greens, floral Chinese oolongs, invigorating British blacks and spicy Indian chais. I've spent countless hours connecting with friends in cozy tea rooms around the world, curling up with a comforting cup to brave the Midwestern winters and cooling off with iced tea on a sunny day. You get the point - I think tea is kind of a BIG deal. Of course this means that tea serves a crucial role in my mixology toolbox. Tea can add so much depth and complexity without loading up your drink with sugar or watering it down. Thus far, I've used it to both infuse liquors and mix with in cold brew form - I've never been disappointed with either approach. This particular cocktail incorporates my favorite tea for fall: chai. I stumbled upon a particularly attractive container of black mission figs at the store and chai came to mind as the perfect spiced flavor pairing. I chose make the figs into a syrup rather than muddling them to extract the most flavor possible. Muddling is ideal for herbs or fruit that holds a lot of juice but not quite as effective for fleshier fruit like figs. As with any fruit syrup, figs simply need to be boiled with water and sugar until they start to fall apart (roughly 30 minutes). The mixture should then be strained through a fine mesh strainer (a spoon can be used to press the liquid through). I rounded off the fig and spice flavors with an exciting small batch bourbon I hadn't previously tried and some lemon to keep the drink on the sour side. The outcome was hands down the best whiskey sour I've ever tried - all of the flavors mingled together fabulously and really helped each other shine. One key thing to note is that this is an excellent drink to make in bulk because only the syrup is labor intensive. I would highly recommend scaling it up for your fall entertaining needs! Shake all ingredients with ice and strain into a rocks glass over a large ice cube. Alternatively, if making in bulk, stir in a pitcher with ice until chilled, then pour into rocks glasses. Garnish with fresh fig slices and enjoy while wrapped in your favorite fall sweater. *To create syrup, heat all ingredients to a boil in a small saucepan and simmer for 30 minutes, or until figs start to disintegrate at the touch of a spoon. Strain through a fine mesh strainer and allow to cool. Store excess in the fridge for up to 3 weeks. Thanks to Belen Aquino for the stunning cocktail photography and to Gather Vintage Tablescapes for the lovely tray, glasses and pitcher. A surefire way to make a cocktail more exciting is to use an ingredient that, in it's raw form, is banned from being imported into the US. To clarify, this particular ingredient is not banned due to being dangerous or lacking in quality but because its a "protected-origin fruit." Intriguing. This means that the smaller, golden and flavorful Mirabelle plums can be found primarily in the Lorraine region of France. Clearly, this means that I need to pack my bags and go back to France, one of my all-time favorite travel destinations. Assuming you don't have the means to set off to France on a whim, you're still in luck. You can find Mirabelle plums imported in processed form - such as syrups and jams. I stumbled upon one such syrup at my go-to grocery store for adventurous cocktail ingredients. Hidden away in the Chicago suburbs and masquerading as your typical discount store, this particular Shop&Save carries a multitude of goods from around the world, particularly from Eastern Europe. The products are both cheaper and purer than their American counterparts as European producers tend to use more natural ingredients. High quality fruit purees, syrups and teas are just a few of my Shop&Save cocktail treasures. Ever since I picked up a Polish rhubarb and Mirabelle plum syrup (for under $5), I've been looking for the perfect cocktail combination to let it shine through. That perfect combination came to me this week when hosting friends who were all in the mood for whiskey sours: rhubarb, Mirabelle plum, Meyer lemons, bourbon and aromatic bitters. Yes, it was as amazing as it sounds. I loved this drink so much that I made it two nights in a row and the only thing stopping me tonight is that I ran out of Meyer lemons. This concoction is boozy and tart yet wonderfully smooth, lightly herbal from the Meyer lemons and with a touch of sweetness from the plum. As with a fine wine, every sip uncovers a new flavor. If you're as excited as I am about this cocktail, drop everything and find your nearest Polish/Eastern European grocery store to see if they have this syrup in stock. Believe me, you won't regret it. I'd also encourage you to use a larger ice cube, either cubic or spherical, as it will melt slower, thereby preserving the drink's flavor intensity. I've been quite satisfied with my recent large cube ice tray purchase - check it out here if you're interested. Cut a slice of Meyer lemon from the center and set aside for garnish. Juice the rest of the lemon into a cocktail shaker and add a few regular ice cubes, bourbon, syrup and bitters. Shake until frosted, then strain into a rocks glass over a large ice cube. Cut a notch in the Meyer lemon slice and place on the glass rim for garnish (and refreshing lemon scent to lift your spirits). Enjoy while discussing plans for your next travel adventure. This past Friday, I got some amazing news - I discovered that I had passed my latest actuarial exam, meaning that I am now only 1 exam away from total freedom and a fancy pantsy professional designation. Total freedom meaning more time to focus on things like cocktail adventures. Needless to say, I was a slightly hyperventilating, prancing mess of a person. When I finally made it home that evening, I was greeted with a congratulatory bottle of goodness from my wonderful husband. He had noticed me excitedly mentioning apricot liqueur on multiple occasions and thought it would be a great way to mark the occasion. It certainly was. Why was I so excited about apricot liqueur? I had tried it in cocktails when going out and had always been impressed at how accurate and bright the apricot flavor was. Some flavored liqueurs stray very far from the original fruit and end up tasting more medicinal than fresh. Apricot liqueur is not part of that unfortunate category. Will picked up this particular bottle at our local Binny's - which we love due to the vast selection and knowledgeable staff. Rothman & Winter Orchard Apricot Liqueur is a delicious Austrian-made mixture of eau-de-vie apricot brandy and ripe apricot juice. Not going to lie, we couldn't resist just drinking some of it on ice - and I highly recommend that you buy it if you enjoy fresh apricots in booze form. I chose to mix the apricot liqueur with a sweeter liquor - and bourbon fit perfectly. Basil Hayden's Kentucky Bourbon worked especially well because it added a hint of spice. I also experimented by adding basil to enhance the freshness of an otherwise strong cocktail and balanced it out with some lemon juice and water. Bitters are optional but I found that including a few drops of aromatic bitters highlighted the spice element I was looking for in this cocktail. The result was pleasantly sweet and spicy with a lovely hint of herbal bitterness. Set aside one small basil leaf for garnish and place the rest of the basil in the cocktail shaker. Add bourbon and muddle the basil and bourbon mixture. Add remaining ingredients and several ice cubes, then shake vigorously until the shaker is frosted. Strain into a stemmed glass, making sure you have shaken the cocktail enough to form a light froth. Top with the small basil leaf and enjoy at a cozy chalet overlooking a glorious mountain view.